Coming here, to the Home Office, under these circumstances, makes today a very strange day for us. It is strange because for many of us here today, who came to this country seeking refuge or asylum, the Home Office symbolises a place for protection, for shelter, peace and freedom. In other words, it represents many of the rights that were denied to us in our own countries. Today, instead of coming here to cry out for your help, we are here to cry at the death of our brother, Jimmy Mubenga. We come here to ask why you deceived Jimmy so badly. We come here to ask why you gave him the wrong set of keys. He asked your permission to enter into the land of freedom, and you gave him the keys for the land of oppression and humiliation. He begged you to allow him to live with his family, and you sent to him alone to the mortuary. You wanted so very much to get rid of Jimmy on that bloody Tuesday, 12th October, that any means, for you, justified the ends. Your hunger, together with G4S’s desire to eat, turned Jimmy into a piece of meat. But we are amazed that, one month later, you have still not digested that meat. Jimmy is still here in the UK. Does this mean that finally, you have granted him indefinite leave to remain? Or are you going to continue with the deportation process? I want to remind you this: Jimmy died because of something called a UK Resident’s Permit, meanwhile British citizens are making their fortunes in Angola because of something called oil. We do not understand why, after living in this country for so many years, Jimmy could not have been allowed the right to live with his family here, especially in these difficult times. After all, it is so many of you who blame the lack of father-figures in black families on the rise of criminality within the British black community. Congratulations, then, with your mastermind plan that removes the father-figure and thereby condemns, in your thinking, yet more innocent black children to lives in crime. Recently, British society was choked with grief by the actions of a woman who dumped a cat in a rubbish bin. Soon after her actions were caught on CCTV, police called her crime an animal cruelty offence because of the likely suffering she caused the cat. That woman eventually resigned from her job because she couldn’t cope with the reactions from her colleagues at work. In Jimmy’s case, although other passengers and airline staff heard his cries of agony shortly before he died, none of you have come forward to say a single word about Jimmy’s suffering. Mary Bale became a hate figure for dumping a cat in a bin. She was under investigation, then charged and finally fined. 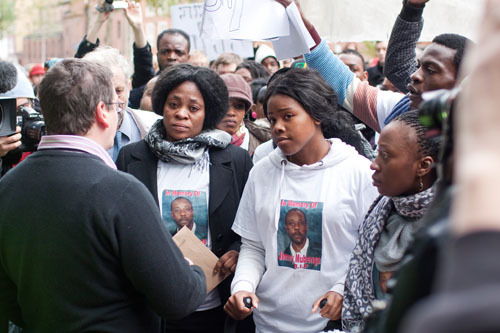 While we wait for the truth to come out on Jimmy’s death, we – the sons and daughters of Africa – are wondering whether the British authorities value a cat more than a person from Africa. 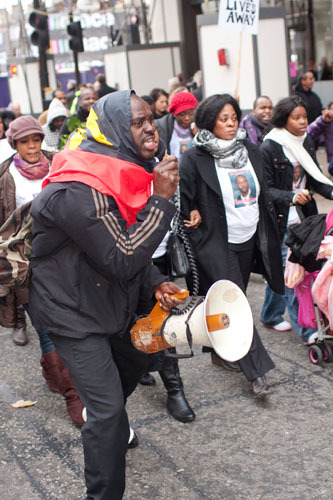 Another report on the Mubenga march from indymedia here. Consider this. We were marching on a working day, a Friday, in central London. 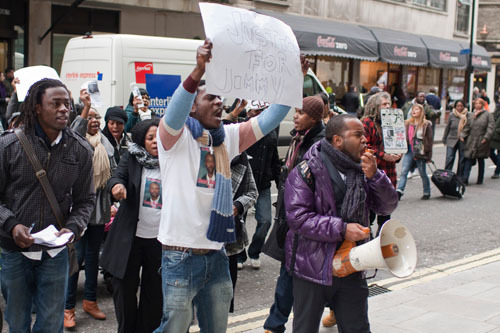 It was a very specific demonstration, to demand justice for Jimmy Mubenga and justice for his family. 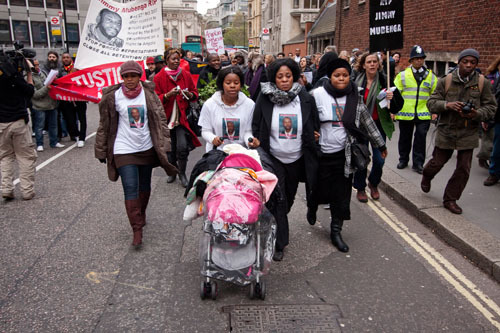 It was always going to be a long walk from the Angolan embassy to the Home Office on Marsham Street. In the event, it became even longer by the time the police had finished diverting us down the back of the Palace and then away from St James’ Park. (The reason: ‘They’re changing the guard at Buckingham Palace.’ Said Alice. ”It would frighten the horses.’ Really? They can cope with a 21-gun salute, so how could they possibly be frightened by a very peaceful demonstration led by a grieving family? ) Consider too the weather. Heavy rain predicted for the entire morning. 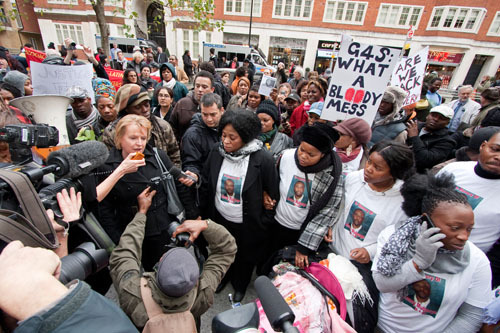 Consider too that many of the target marchers – the Angolan community in the UK – came under pressure not to come out. They had to draw on significant reserves of courage and determination to join the rest of us who were under no threat whatsoever. Taking all this into account, we were delighted to be joined by over 150 protesters, the vast majority of whom were Angolan, some Congolese, a couple of Iraqis, a group of Brits, an Australian, and various others. This was already a success. We began at the embassy, which had officially closed for the day. A generous interpretation for that might be that it was the 12 November, the day after Angola’s 35th anniversary for independence, and therefore a day for embassy staff to be nursing their Hilton Hotel hangovers from the night before. A less generous interpretation is that they wanted to avoid any confrontation – or even any dealing at all – with us. 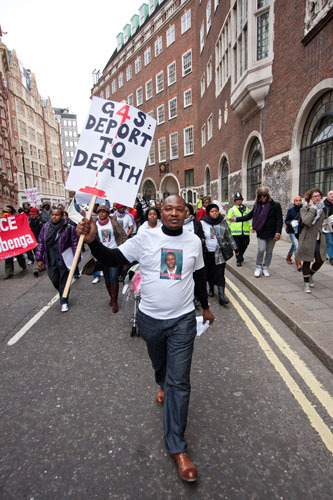 One month on from Jimmy’s death aboard a British Airways flight, the Angolan embassy has not breathed a single public syllable about the death of an Angolan citizen whilst in the care of British justice. 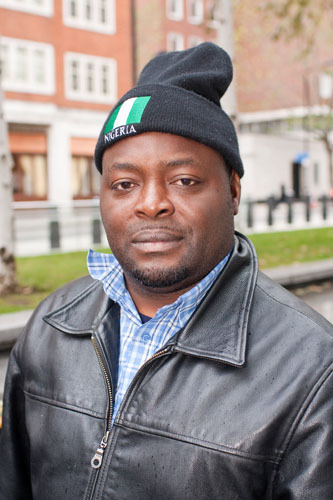 No short statement has been released to show they support Jimmy Mubenga’s distraught family. Which was precisely why we decided to start at the embassy: to encourage Her Most Excellent Ambassador Ana Carreira to stand up for truth on behalf of an Angolan man, a citizen of the country for whose freedom she fought. Could the Angolans not take a leaf out of the book of the Brazilians? The then President Luíz Inácio Lula da Silva, on 8 March 2006, met personally with the family of Jean Charles de Menezes and gave them his word that he would do all he could to secure the truth of Jean’s death. Megaphone man in full swing! Several marchers ran up and down the pavement distributing leaflets to the public, to tourists, businessmen, workers waiting at bus-stops, passengers in the backs of taxis, bus-drivers and even the police themselves. The police had told us to stick to the pavements but we were too many and the pavements too narrow. We hijacked the bus-lane and jumped all the lights. Everything seemed to be going pretty well until we reached Hyde Park Corner and the police forced a diversion. Shortly after that, they stopped two of our supporters and pinned them against Her Majesty’s Palace wall. Confusion ensued as we all stopped to ‘Let Them Go!’, and eventually the police – now following us on three motorbikes and a police van plus several others on foot – did just that. As we were about to set off once more, would you believe it a G4S van approached from behind, heading towards Victoria Station. Our chanting switched to new slogans: ‘G4S, what a bloody mess! 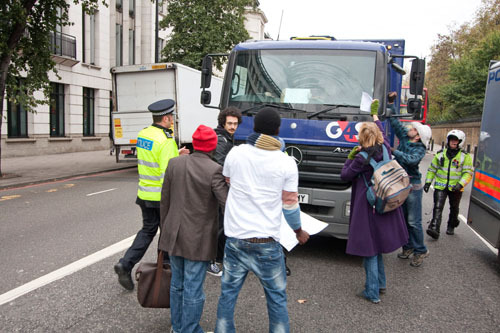 G4S, why Jimmy’s death!’ The van ground to a halt and we chanted and shouted and shouted and chanted before gathering speed once more towards HO Marsham Street. As we passed down the south side of the Palace, preparing to go straight along the bottom of St James’ Park before hanging a right towards the Home Office, the police diverted us once more, pushing us south and away from the Park. My sense of direction is good enough to know that we would still be fine unless we got diverted again. The other organisers and I were unsure as to whether we should have been stopping to argue wtih police or carrying on through the diversions, taking them as it were with the proverbial pinch of salt. I opted for the latter. I was worried that they were trying to provoke us, and trying to get some of the demonstrators wound up so they could arrest them. So we bent with the wind as the Buddhists say, and agreed to the diversion. The new route took us down Buckingham Gate before taking a left into Petty France. On we went chanting all the way. At one point we passed to our left the Wellington Barracks, home to the Foot Guards Battalions on public duties in London, to all of the Foot Guards bands and all the Regimental Headquarters. At this point, I was up at the front, just a little ahead of Jimmy Mubenga’s family who had with them a baby, when I heard a loud shout. I turned around and saw a litre bottle of Fanta – at least half full – rolling along the road. One of the delightful young men living in the Barracks had hurled it at our march, just a few feet from the baby. It didn’t hit anyone, but if it had it would have done very nasty damage. Despite the fact we were being accompanied by several policemen and women at this stage, not one of them noticed the flying Fanta. Now, a plastic bottle of liquid may not be as dangerous as a fire extinguisher, but don’t tell me that if one of us had thrown that bottle, we would not have been arrested immediately. And don’t tell me that the police would not have noticed. Were they all suddenly and spontaneously distracted? And why tell me did a foot guard suddenly feel it an appropriate action? 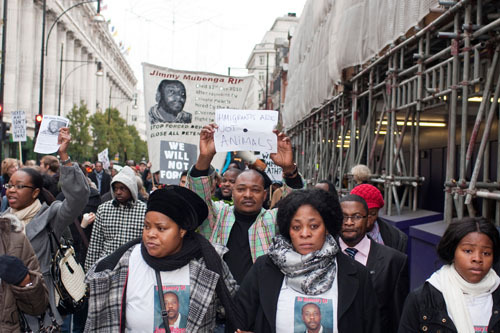 We were a peaceful demonstration asking for justice and truth about the death of Jimmy Mubenga? How does that in any way threaten a single member of Wellington Barracks? Again, I’ve wondered if it wasn’t a mistake not to stop and have this out there and then with all the young men leaning out of their windows above us. To demand that one of them come forward and own up to his absurdly stupid, dangerous and provocative act. But all the diversions were making us late, and we had a line up of speakers waiting for us at the Home Office. Moreover, Jimmy’s family had made a request that the demonstration remain peaceful: the last thing we wanted was any trouble. So we pushed on, passed the Ministry of Justice – at which we had a damn good rant – before crossing Victoria Street and turning right down Great Smith Street which leads into Marsham Street. And still, it had not rained. There were some excellent speeches at the Home Office including (among others), Jeremy Corbyn MP, Deborah Coles from Inquest, Emma Ginn from Medical Justice, the inspiring Adalberto Rosário de Miranda from the Union of Angolans UK (whose speech we hope will be up in full on the internet within the next 48 hours), Ciaron O’Reilly who spoke about being deported from the United States, Ayo Omotade who told a horrific but eventually triumphant tale of his own experience on a BA flight, Dashty Jamal who spoke about the horrors of Iraqi forced deportations, Guy Taylor (who blogged here on the demonstration with some great photos), and many many more. Several Angolans, including José Gomes, Oswaldo Muniz and Saidy among others, also gave brilliant impromptu speeches, pointing out the hypocrisies of international politics, international borders and international business, with particular reference to the oil interests that Britain enjoys in Angola. 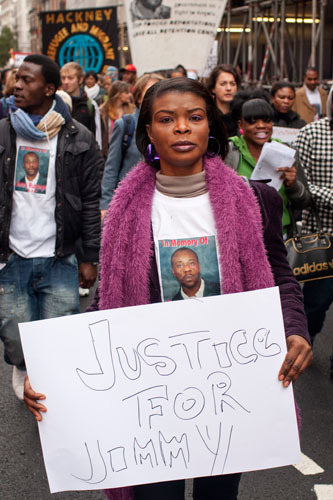 There was a very powerful sense among Angolans that this demonstration for Jimmy symbolised something even larger than the importance of the event itself: that it is possible for the community to come together, to support each other, to brave intimidation and fight for human rights and justice and truth. While some of us here in the UK take demonstrating for granted, believe me when I say that most Angolans do not. Several (British) people have been in touch with me since Friday to say that they were inspired by the Angolan community here, by their sense of purpose, by their determination, peaceful solidarity and camraderie. What more can you ask for? I was inspired by them for sure, but also by the many people I’d never met before who turned out as individuals because they had heard about Jimmy and wanted to offer their support. We came together for over four hours as strangers and by the end, we left as friends, having swapped contacts and a determination to fight for the truth on Jimmy’s death until we’ve won the battle fair and square. Media coverage included Socialist Worker, BBC World Service Focus on Africa (if you want to hear it, email me lara@larapawson.com or find me on Facebook), BBC Radio 4’s PM (available for 5 more days here at about 32’00 into the programme, just after midway news), BBC TV, and Lusa. There was also a journalist from The New York Times who came with us for the whole march and is writing a longer piece about deportations from Europe, which should be out soon. And of course, photographer, Marcin Gulbicki who took all the pictures in this post and many more. On a slightly lighter note, something that made me chuckle was regarding the two men that the police had tried to arrest from our march. They were a hooded up pair, their faces wrapped in scarves, as though they were planning on doing something very naughty at some stage. I heard other demonstrators calling them anarchists, and later one of the policemen said to me ‘Did you know you had anarchists on your march?’, which I found hard not to giggle at. At the very end of the demo, when many people had left, the two ‘anarchists’ were still hanging around. So I went and thanked them for coming along and giving their support, and was reduced to more giggles once more when they opened their mouths to reveal voices heavily threaded with the tones of what I am sure must have been a public-school education. They even seemed a bit nervous, a bit shy, and certainly very sweet. Almost disappointing if I’m very honest. Though not nearly as disappointing as this. The assertion that Jimmly ‘fell ill’ whilst being deported is misleading and presumptuous. Have a guess: what is G4S? Leading international security solutions, that’s who we are. We even have a heritage that goes back over a century. We protect rock stars, ooh-ah, and sports stars, ooh-ah, and people and property and even some of the world’s most important buildings, ooh-ah. Some of the people we protect are protected differently to other people. Sometimes, although we aim to ensure that travellers and other nice people have a safe and pleasant travel experience, we also promise to leave them haunted and even traumatised for years to come, ooh-ah. 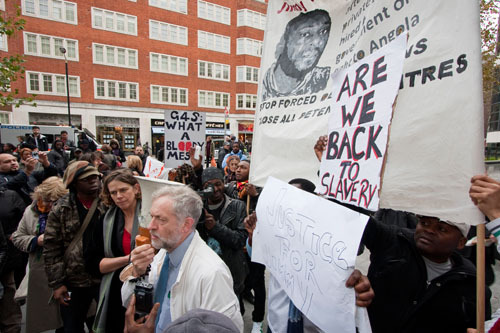 Certainly it is true, that in more ways than you realise, G4S – what a bloody mess – is securing your world. But not necessarily their world. What matters to us is that you feel safe from them. This all part of our strong culture and distinct set of values. So as you see, we like to generate trust, to work in partnership, expertise and, yes! you guessed it, solutions. Our performance is improving year-on-year. So next year, we are hoping that two or perhaps three people will cease to breathe whilst in our care. The year after, maybe three or four. What matters is that we employ the best people, the experts, people who have developed their competence and who know that being paid per deportation really does make them do the job to the best of their ability. We inspire our staff with our values. We collaborate so we all work together as a team. And we love changing our name, again and again, so no one ever quite knows who we are. Meanwhile, here I am on Jimmy Mubenga in The Guardian.